The most important benefit of yoga is physical and mental therapy. The aging process, which is largely an artificial condition, caused mainly by autointoxication or self-poisoning, can be slowed down by practicing yoga. By keeping the body clean, flexible and well lubricated, we can significantly reduce the catabolic process of cell deterioration. 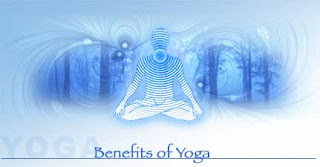 To get the maximum benefits of yoga one has to combine the practices of yogasanas, pranayama and meditation. Regular practice of asanas, pranayama and meditation can help such diverse ailments such as diabetes, blood pressure, digestive disorders, arthritis, arteriosclerosis, chronic fatigue, asthma, varicose veins and heart conditions. Laboratory tests have proved the yogi's increased abilities of consciously controlling autonomic or involuntary functions, such as temperature, heartbeat and blood pressure. Research into the effects of yogic practices on HIV is currently underway with promising results. According to medical scientists, yoga therapy is successful because of the balance created in the nervous and endocrine systems which directly influences all the other systems and organs of the body. Yoga acts both as a curative and preventive therapy. The very essence of yoga lies in attaining mental peace, improved concentration powers, a relaxed state of living and harmony in relationships. Through the practice of yoga, we become aware of the interconnectedness between our emotional, mental and physical levels. Gradually this awareness leads to an understanding of the more subtle areas of existence. The ultimate goal of yoga is to make it possible for you to be able to fuse together the gross material (annamaya), physical (pranamaya), mental (manomaya), intellectual (vijnanamaya) and spiritual (anandamaya) levels within your being. Applications are invited from eligible candidates for All India Common Entrance Test (PIMS-AICET-PG 2012) for selection of candidates for admission to Postgraduate Courses in Medicine (MD/MS/DIPLOMA) & Dentistry (MDS) for the academic year 2012-13 in the constituent colleges of Pravara Institute of Medical Sciences (Deemed University). Duration of course: Three years course. The respective Colleges are recognized by U.G.C (University Grants Commission) / M.C.I. (Medical Council of India) /D.C.I. (Dental Council of India) for both Undergraduate and post graduate courses. A candidate who has completed one year compulsory rotating internship or is likely to complete the same on or before 30 April, 2012 can appear for PIMS-AICET-PG 2012. A candidate should have obtained permanent registration with MCI/DCI (as the case may be) or any state council. If candidate does not have such registration, he should obtain the same within one month from the date of his/her admission. Candidates who are previously registered and pursuing/completed the PG degree course or have obtained PG degree, are not eligible for appearing at PIMS-AICET-PG 2012. Candidates previously admitted to PG degree course and resigned/left the seat are not eligible for appearing at PIMS-AICET-PG 2012. Candidates who have completed Medicine postgraduate diploma course or would be completing by 31.03.2012 will be eligible for PIMS-AICET-PG 2012 for admission to Medicine postgraduate degree in the same subject only.